Please NEVER re-use your U-Bolts! When a u-bolt is tightened to its recommended torque level, the threads stretch as they mate with the hi-nuts. During the removal of the hi-nuts, a cross threading occurs that makes it impossible to adequately re-torque the u-bold again. Make sure your drivers are safe on the road and throw away those old, used u-bolts! 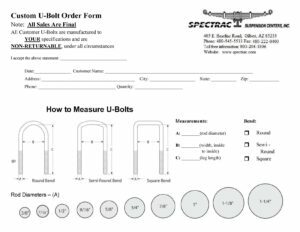 Spectrac Suspension Center makes it easy to order new u-bolts and they are manufactured to your specifications (while you wait)! We keep a large inventory of threaded rods and our facility will bend the u-bolts to exactly the specifications you need.